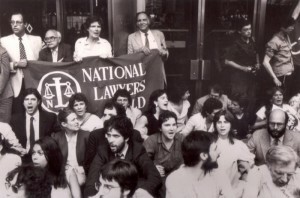 The National Lawyers Guild is the nation’s oldest and largest progressive bar association and was the first one in the US to be racially integrated. Our mission is to use law for the people, uniting lawyers, law students, legal workers, and jailhouse lawyers to function as an effective force in the service of the people by valuing human rights and the rights of ecosystems over property interests. This is achieved through the work of our members, and the Guild’s numerous organizational committees, caucuses and projects, reflecting a wide spectrum of intersectional issues. Guild members effectively network and hone their legal skills in order to help create change at the local, regional, national, and international levels. The NLG is dedicated to the need for basic change in the structure of our political and economic system. Our aim is to bring together all those who recognize the importance of safeguarding and extending the rights of workers, women, LGBTQ people, farmers, people with disabilities and people of color, upon whom the welfare of the entire nation depends; who seek actively to eliminate racism; who work to maintain and protect our civil rights and liberties in the face of persistent attacks upon them; and who look upon the law as an instrument for the protection of the people, rather than for their repression. Learn more about our history at our 75th anniversary retrospective, and at the links in the drop-down menu above.